The TCP LED Linear High Bay lamp is a high efficiency light that consumes up to 72% less energy than HID alternatives. It can be used wherever exceptional light is needed for mounting heights from 20 to 40 feet. This lamp has a superior lumen package that makes it a suitable replacement for linear fluorescent and metal halide high bay lighting systems. In addition to being highly efficient, this LED High Bay generates low heat, produces excellent color, has a long lifetime of 50,000 hours, and has improved uniformity. This LED linear high bay features an angled design that produces a larger beam spread and a clean cut off. It is also UL approved for damp location use. 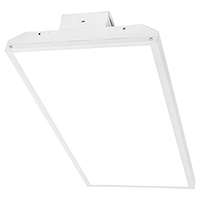 Primarily, this lamp is used in commercial and manufacturing buildings, warehouses, and in open and stack aisles. The 5000K color temperature produces a daylight white light. Mounting hardware is included with the lamp.